Thanks for coming back for part 2 of the Epilogue. Now that we've talked about Glogirly's birth father, we're going to answer all of the other questions you asked. Glogirly and I hope you enjoy learning a little more about what has happened since her first visit. I'll be posting the final epilogue, part 3 soon as well. In part 3, I'll tell you about what Glogirly is planning for the future. "Have any of her new family come out to visit her and Gloman, or have visits all been going to California?" Glogirly has been out to California to visit five times since her first trip in August of 2007. Two of those trips were with Gloman. She brought Gloman with her just one month after her first visit. When they arrived, Dorothy brought them to the cemetery where Alice's new marker had just been put down. The entire family...even those who had not spoken in 20 years, came to a big barbecue Jim hosted up at the ranch in honor of Glogirly and Gloman. It was a day no one thought would ever come. But in the name of forgiveness and family it did. In March of 2008, Glogirly and Gloman drove to CA to see Gabe (Gloman's son) graduate from boot camp and become a US Marine. The three of them had a chance to visit everyone again at the ranch. Then later that year in August, Dorothy and her son Jeff came to Minnesota for the first time. Glogirly and Gloman brought them to their favorite getaway up on the north shore of Lake Superior in northern Minnesota. After just a few days, Jeff went home, but Dorothy stayed on. She and Glogirly spent two weeks together. Dorothy is an adventure seeker and loves history so Glogirly showed her all around Minneapolis and St. Paul. They went to museums, the state capitol, and enjoyed walking along the Mississippi River near Glogirly's downtown Minneapolis home. Glogirly had surgery (scheduled outpatient) and Dorothy stayed to help her recover. It's a time that Glogirly will always cherish. 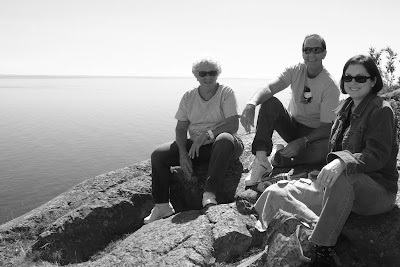 Dorothy, Jeff and Glogirly on the shore of Lake Superior in northern Minnesota. 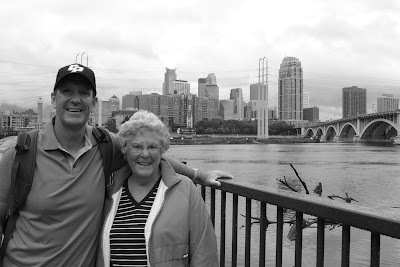 Jeff and Dorothy at the Mississippi River with downtown Minneapolis in the background. "Do any other of the family members have KITTIES!!" Only Glogirly's cousin, Candy, has a kitty. Her cousin Jeff has a little Yorkshire Terrier named Chewy. He looks like a tiny Chewbacca from Star Wars. Glogirly's Aunt Armi has a sweet, old ranch dog named Pepe. Pepe usually sleeps outside, but on the last trip he snuck inside and slept with Glogirly. "Do you have a story, Katie?" Why, yes I do!!! I'll have to share MY story with you in an upcoming blog. But I can give you the short version - Gloman actually adopted me. I was his anniversary gift to Glogirly. And Gloman, if you don't already know, is a self-proclaimed DOG person! He doesn't even like cats. I have of course changed the course of his life. "I hope the contact has been good with Glogirly's family in the last four years?" The contact has been wonderful. Glogirly has visited a number of times and each time she's been able to see almost everyone. In-between visits, she has mostly stayed in touch with Dorothy. They talk regularly every couple of months. With each visit, she learns more and more about her family. In fact, she recently flew out for another big barbecue at the ranch back in October. It's when she came home from that trip that she decided to start writing. Within a few days, the first chapter of Searching For A Girl was posted to the blog. "We would love to see more pictures of Glogirly's Mom, Alice! She is so pretty and looks so much like Glogirly, we think." "We adopted 2 children, and of course, my question is more about how you felt to be an adopted child. One of my best friends was adopted, by her grandparents, because her parents died in a car crash, and she told me that, every time something went wrong (in her eyes of course...) she thought "if my mum was still alive, it would be different." Now she has two kids herself, teenagers, and realized that she was wrong, but...how sad." From a very young age, Glogirly knew she was adopted and understood what that meant. Her parents were very open and honest with her and did a wonderful job of helping her to understand how lucky and how loved she was. She never felt like anything was missing. Except that growing up as an only child, she had always wished for a sister or a brother. But her parents let her bring a friend with on many family vacations, which in Glogirly's eyes was WAY better than a sibling! 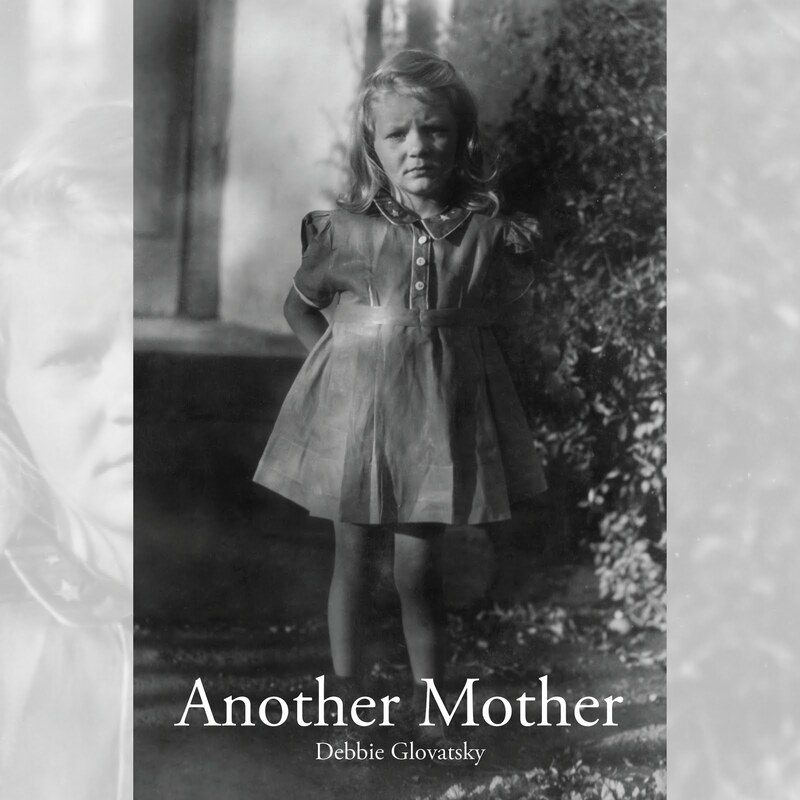 To Glogirly, her parents portrayed her birthmother as a brave young woman who could not take care of Glogirly herself, but loved her enough to give her to a family that could. This created a foundation of love and respect for a woman that Glogirly thought she would never know. All grown up, Glogirly realizes that not everyone is as fortunate as her. Not every story has a happy ending. No family, even hers, is perfect. But she is and will always be very grateful for her families. Her adoptive family AND her birth family. "Our children gave us so much, and I cannot help thinking of your parents, who must have been very grateful to have a daughter like you." ... "Your story is really moving, and I think everything was possible because you have an open mind, taught by your adoptive parents." Glogirly says there are moments, snapshots of memories, that stay with you forever. She remembers sitting around the kitchen table at suppertime with her mom and dad when she was 14. There was a little TV on the counter that her mom usually shut off during mealtime, but it was turned on that night. There was a news show called PM Magazine on the air and they were doing a story about a couple that was adopting a baby. Glogirly, her mom and dad sat there, still, transfixed on the tiny screen. The two new parents were anxiously waiting in an airport for their newly adopted baby to arrive. The cameras filmed them as an adoption worker arrived and placed the baby in their arms. The mother was holding the baby and the father was holding both of them. Tears were streaming down their faces and they couldn't stop smiling. When Glogirly looked over to her parents, they were still staring at the TV. They were holding each others hand and tears were streaming down their faces. They told Glogirly it reminded them of when she was put into their arms. It was the happiest day of their lives. And they were so proud of Glogirly and the young woman she was becoming. "We were wondering what's happened since?" That's a great question, Fin. Unfortunately there have been a few sad events. 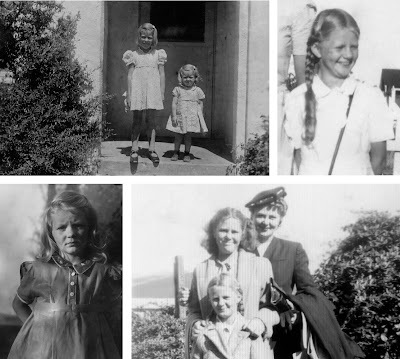 Glogirly's Uncle Fred, one of Alice's four siblings, was in a nursing home when she met him on her first visit to CA. He passed away shortly after. She remembers his big smile, love of strawberries and a special photo of his daughter he kept by his bedside. Jeanette, the oldest sister, developed cancer about a year after Glogirly's first visit and passed away that December. Glogirly feels so fortunate to have had that conversation with her about her parents, the adoption and how thankful she was for Alice and her sisters. One of Jeanette's children, Mike, also passed away from cancer not long after Jeanette. Glogirly had a chance to spend time with Mike on a road trip from San Luis Obispo to Sunnyvale with Dorothy. Dorothy is doing great. She's active, healthy and very involved in her son's and grandchildren's lives. She still loves getting to the opera or a Giants game with her best friend, Thelma. Glogirly and Dorothy have kept in touch over the phone. Each time they talk they feel recharged and reconnected. With each conversation, Glogirly is reminded of her adoptive dad and his passion for life. Just like Glogirly's dad, Dorothy's glass is always half full. Glogirly is hoping to make another trip sometime soon. I'll tell you about her plans in Part 3 of the Epilogue. Thanks everyone for all of your comments and questions! Thank you so much for sharing this with all of us. I was on the edge of my seat waiting for each installment. Again, I will say this would make an excellent book. I too wondered how life had treated everyone since 2007. I am so glad that you have Dorothy. Looking forward to the next and final chapter. It was so great to read the answers to all the questions. Thank you so much for filling us in even more. 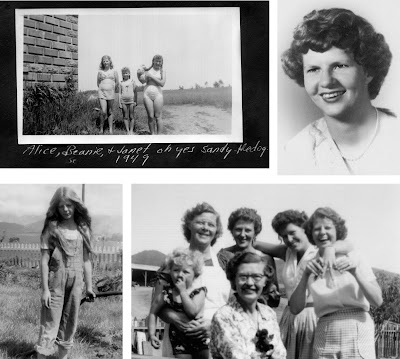 We love the photos - especially of Alice with her long blonde braid. How wonderful that Dorothy came and stayed for 2 weeks. We are so happy you found your other family when you did. We look forward to part 3. This is just the most beautiful story M has ever read. It has brought tears to our eyes many times. We are so happy for Glogirly and her new family. It is a happy ending for sure. Thank You! Glogirly, this has been a wonderful experience, and I'm honored that you shared it with all of us. This has been such a great story! We're so glad that you shared it with us! I'm loving all of these updates. I'm so sorry that Glogirly lost some family members that she was just getting to know, but at least she got the opportunity to meet them. Thank you so much for this wonderful story. I feel privileged to have been able to read it. So many thoughts come to mind, but suffice to say I think Glogirly has been very blessed and am so glad there is this continuing connection, particularly with Dorothy. Fate works in mysterious ways and Glogirly got to meet Jeanette before she passed away. As you know, these stories don't always have happy endings. We just had a case where a baby who was stolen shortly after birth had a reunion with her birth mother after 20+ years. Unfortunately, it turned out that she only wanted a cut of the money her mother got when she sued the hospital for losing her newborn. Thank you, Glogirly, thank you so much for being so transparent! I just want you to know our adopted children gave us a LIFE, not more,not less. I think it is the same for you and your adopting parents. You've spun a great tail Katie! Thanks for sharing Debbie. So much has happened since you moved across the river. Your grace is inspiring...I started yesterday and rushed home to finish today..tears flowing at every other paragraph. Oddly, I just finished a book with an adoption related theme...Chasing China: a daughter's quest.....yours is more moving and so well written. I'm so thrilled you read the story! ...and enjoyed it. I'm putting plan together to expand upon it and turn it into a book. Yes, it's Kelly.I have a new a Kindle and am still getting used to it. This is a best seller already...there are so many messages and themes...so powerful. I will tell everyone you decorated our patios for Christmas one year...long before you achieved fame as an author. Loved it! I hope you keep the cat voice etc. Had to keep going till I finished it. Very interesting story. So glad Glogirly had a good life with her adoptive family and now has a good relationship with her blood family.